Fly Away is a very popular song that you'll love playing, since it is another one of those rare gems where you'll be able to play along with the original track very quickly. This lesson will teach you all the chords and strumming patterns you'll need to play like Lenny himself 🙂 So plug in your amp, and let's get to it! The Fly Away guitar lesson starts off by teaching you the 5 basic chords you'll need to master to be able to play this song. Now be prepared to play lots of barre chords with this one, but if you're not that comfortable with barre chords yet, you'll also learn to play the song using power chords. Use the power chord version if you're not that proficient with barre chords, but aim to play it using the full barre chords with time, so practice them every day. Once you learn the chords to Fly Away, you'll learn the strumming pattern you'll be using all throughout the song. Feel free to experiment with the strumming pattern while playing the song though, that's what Lenny does as well, and it's just good practice to fool around and come up with strumming patterns of your own. After the strumming pattern, you'll also learn to play the base guitar part that is played during the verse. Fly Away was released on Lenny Kravitz's 1998 album, "5". It is one of his most successful songs to date, reaching the top of the charts in several countries, as well as earning Lenny a Grammy Award in 1999 for best male rock performance. Sorry, but you've reached a premium content area. The download of the Fly Away tablature file is only available to premium members. Sorry, the same goes for the backing track. To download the backing track to Fly Away, please log in and revisit this page. 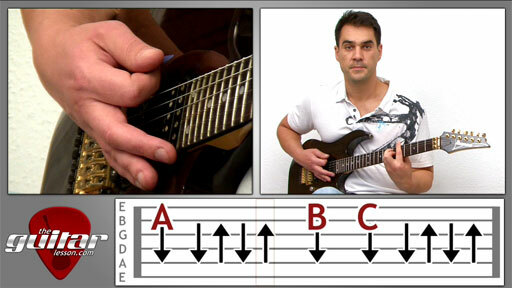 The D barre chord at the above material include the e-string, but the barre chord at the chord charts don´t. Hi, the D barre rooting at the 5th fret of the A string does not use the low E string. Or do you mean the high E string? You don’t need that either, not because it wouldn’t be correct, but because it’s nearly impossible to pluck holding that barre shape.